Hello, lovelies~ I am still trying out a couple of CC cream to find one that is on par with my HG from Rachel K. When I saw that Banilla Co had a CC cream on sale, I bought one to try out. After a month, here is what I think of it. The CC cream comes in a white box that has all the description of the CC cream in Korean language. I don't really understand it, so sorry if I can't help you there.I can't say much for the ingredients because they’re all written in Korean language. Hopefully, I’m able to find one that is already translate to English. The CC cream comes in a white bottle with pink inscriptions on it, similar to the box packaging. I like that it has a pump packaging because it reduces the chance of excess CC cream when dispensed out of the bottle. One pump of this CC cream is too much for my whole face, so I would probably use half a pump in the future. 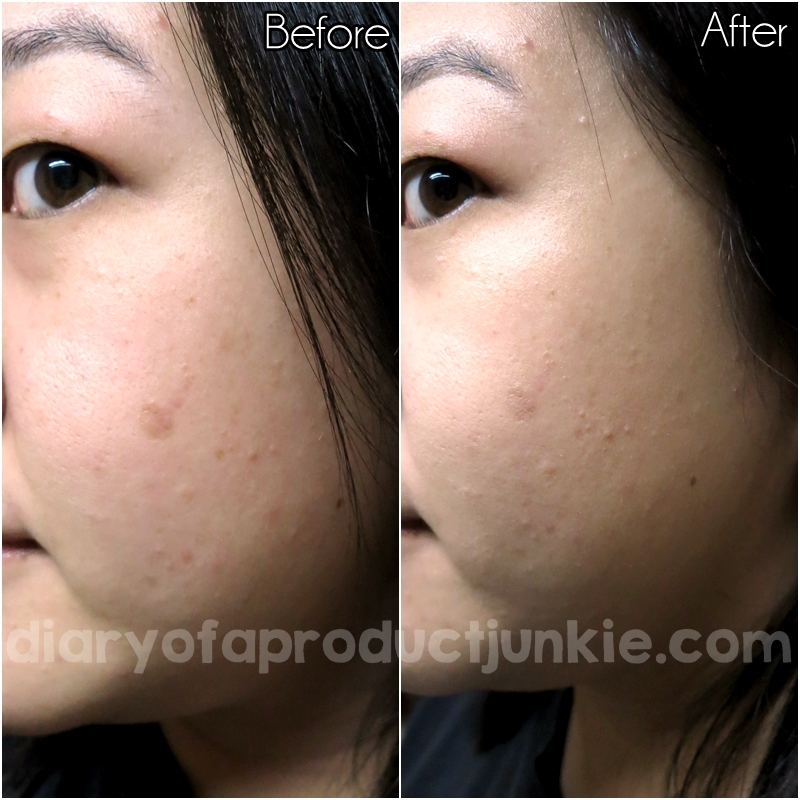 The CC cream is white at first, but as I spread it on my face, it turns to a natural beige color. Honestly, I don’t understand the purpose of making it change color aside from the coolness factor. I feel that it would be better to just come up with the color (natural beige) from the first place, instead of having it change as it is rubbed on the skin. It’s not like it is adapting to the color of the wearer. I tried it on Mr. G’s face and it didn’t ‘adapt’ to his skin tone, it just made his skin looks grey, lol. Unnecessary luxuries, I guess. I was a bit skeptical of this CC cream at first because I thought it would be a ‘draggy’ consistency and make me look like a ghost. However, it blends and spreads on the skin evenly and easily, given that I use my fingers instead of a brush. I tried blending the CC cream with a brush only to find it blends unevenly on my face. The color of the CC cream deserves a standing ovation from me as it did not turn my face ghastly white or grey. If you’re a fan of dewy finishes, then this is the CC cream for you. 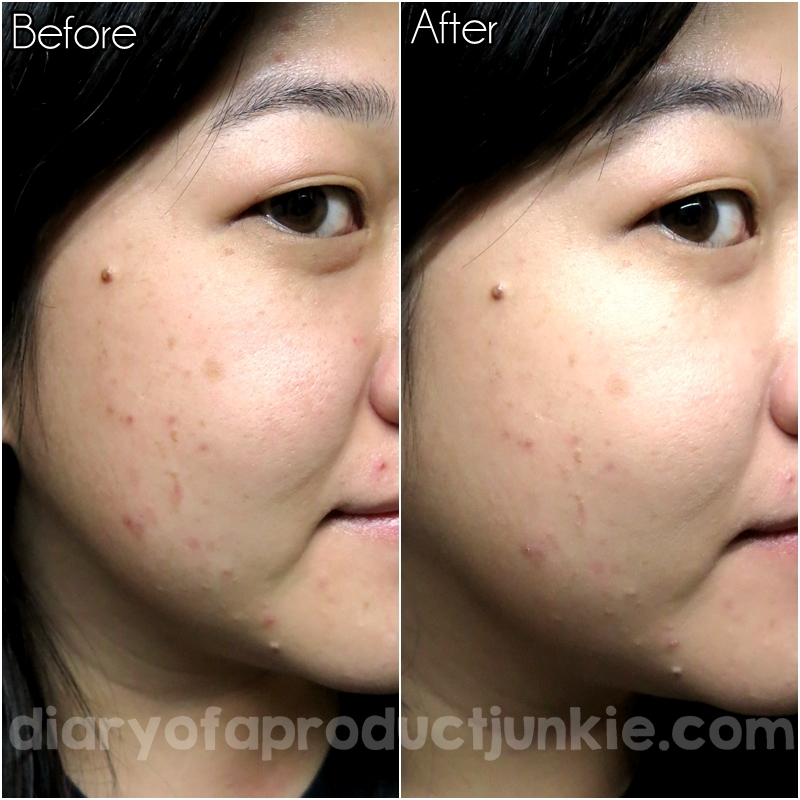 It gives my face a healthy-skin-appearance by giving it a nice sheen on my face. It looks gorgeous! 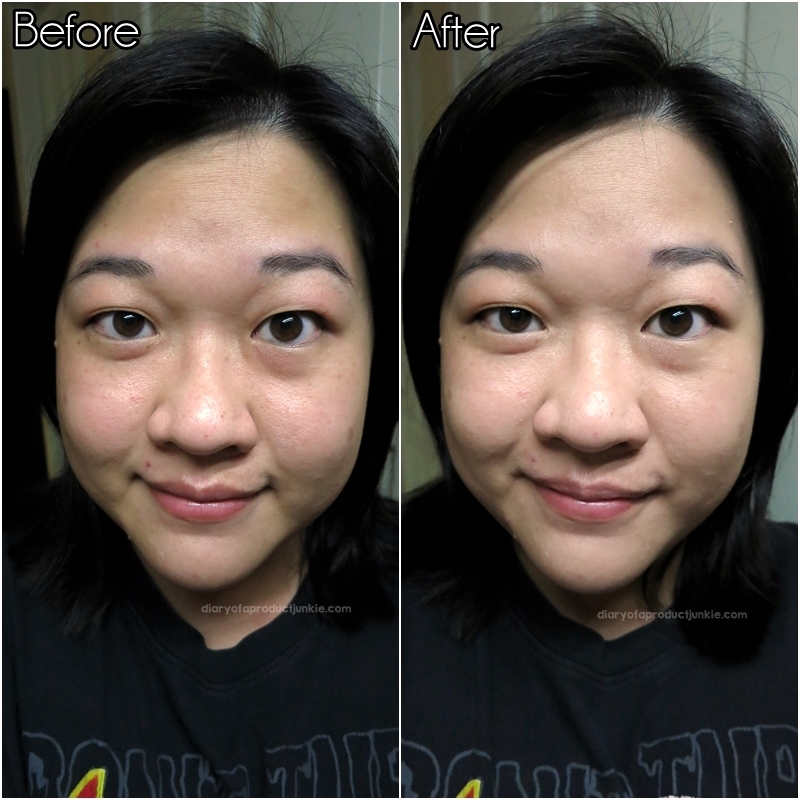 I dust a small amount of powder on my T-zone and natural look is achieved. Also, it doesn’t really have great coverage, probably a light one at best since it does even out my skin tone and reducing the appearance of redness on my face. Since it has a dewy finish, the oil control is moderately lacking in this CC cream. On my very oily skin, this CC cream doesn’t stand a chance of controlling my oil after 1.5 hours. I don’t blame it, though. It is meant to give a dewy finish. Overall, this CC cream is quite remarkable in giving my face a healthy appearance, even though it is dewy. However, I like the light coverage for everyday use along with the sun protection. I just don’t find the color change necessary. Still, this looks like a better CC cream than the one from Etude House. Tried it on my hand the other day and it looks stark white, urgh. I would say that this CC cream performs slightly below par compared with my Rachel K CC cream. However, I still love the dewy finish and lightweight feel on my face. For me, this CC cream is kinda like the Rachel K's counterpart because this one is dewy, whereas Rachel K's more satin-matte.